We made the decision in early 1999 to put our phone number everywhere on our web site so our customers can call us. We don’t have 24/7 coverage but we have enough staff to handle the phone during office hours. We never let the phone ring 2 or 3 times. There’s a voice that answers and customers are rarely put on hold. A knowledgeable staff answers questions. If there is a concern, it is quickly handled. We are also very generous in our return policy, in giving information, in helping people along or in making a decision or to resolve a problem. Has shipping costs deterred customers? Probably. But we have selections and we have service. Yes, our products are expensive to ship. But we cut our margin so we can stay competitive. If somebody go to a big toy store, and if they find that one specific item that we also sell, many times they will find it for less. With specialty stores, we are generally more competitive. Where we blow everyone out of the water is when somebody is sending it as a gift. No one will gift wrap these wagons because they’re too large. So we will gift-wrap them. We gift wrap them, put a card, and ship them anywhere in the country for the same costs, as you would have it shipped to your house. And many times, for the same costs as you would pick it up somewhere in a specialty store. If you go to ToysRUs and get the wagon for less, and try to wrap it and ship it, first of all it would take you about three hours to do it and it would cost you the same amount of money. We have the extreme advantage when you are trying to send it as a gift. It is a big bulky item. So when you buy it from a store, you have to get it off the shelf, bring it into your car and try to get it into your car. 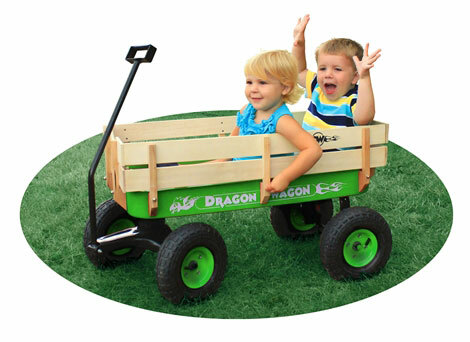 Imagine if you are a parent with screaming kids trying to fit this big wagon in your hatchback or your little trunk – it is hard. There is a cost difference, but convenience wise, we can blow the competition out of the water. How are you managing the growth of your business? In the early part of 2000, we were experiencing triple growth over the year before. After three years of being in business, we were heading to about 24-fold growth over our first year. At that point, I was considering whether to outsource our fulfillment or expand our business. I wasn’t sure what was going to happen. I decided to outsource because I didn’t know how much more we are going to grow. If the growth stalls and I expand, we would have people sit around in an empty warehouse. So we decided to outsource our entire fulfillment in September 2000. And of course, the market started to crash. Instead of having triple growth, which we were on target until that second quarter, we slowed down to about 50 percent growth. So we ended up having a 2-fold growth instead for 2000 over 1999. Our decision to outsource was good since we are not overextended now. We’re still strong and focusing on our customer service. Our repeat customers and referral customers are coming back very strongly because of the service we’ve given them in the past, and that has propelled us to 60% growth this year over the last. During the early days of your business, you worked from home. What was it like? It wasn’t that difficult because of the fact that we were virtual. The manufacturer handled the fulfillment. We did not have phone support back then. It was just answering emails, processing the orders and shipping them off. Shortly thereafter, the online business was incorporated with my handyman business. I then had some staff to assist with that. I transitioned that other business out and kept bringing in employees as necessary. We now have 5 employees. What was the turning point when you realized you had to bring your business out of your home? We planned for the growth of the business. We intended to bring the business out of the house into its own space. It’s always a stretch to sign a lease and to acquire the equipment and to do all that. Our projections were such that we were still acting conservatively in what we did. We could go for a brand-new office, all new furniture and all that. Instead, I just moved the business about 200 feet from my house to a little storefront that was just across the street. It was like being at home because I have my computer at home, I could work at home if I wanted to, or I could walk to the office to see how things are doing there. We’ve always taken very conservative steps. And we always leverage and maximize our equipment, our space, our people. My customer services reps were also loading and unloading trucks. We’re designing the web site. We’re handling the accounting. So I have everyone handling every skill and every job that needs to be done. So what are the factors that made your online business successful? It was our excellent customer service. Plus, our great placement on the search engines. One of the secrets that made our business a success is that everything — from the people to the equipment — have been leveraged beyond their initial capacity. Take for example our order processing system. Instead of buying software, I converted the accounting system QuickBooks, which I used for my handyman business, into an order processing system. It was not perfect as there was a lot of manual work that needs to be done with it, but it kept things working nicely. It efficiently tracked our customers. We were able to watch inventory, and it ran smoothly. But as we were expanding and our customer base was growing, we needed a multiple customer service software. It was more than our system could handle so we went looking for another system. Some systems went up to $50,000 to $70,000, but nonetheless needed regular maintenance. We were able to find one for $6,000 that was an off-the-shelf product. There wasn’t a smooth interface between this new system and the one we had, but we figured out a way to tie up the two systems together. Now, we have a very efficient, smooth running system. It helped that we’ve done it manually before so we knew what the parameters were and what we needed to do. So we could figure it out. When we started dealing with other companies, such as the fulfillment company, they would brag about the half-a-million dollar system that they have put up; with 4 IT staff to maintain the system full time. It took them 6-8 months just to make that system working. Our very simple system, I would say to this day, works more efficiently than somebody’s half-a-million dollar system that I see running. What advice can you provide other online entrepreneurs? Expect profit in your third year if you do everything right. Don’t expect profit from day one. So many people are expecting to earn money from day one. Because of our exposure on Yahoo! now – I am one of the featured merchants – people have been asking me for advice. There was someone who bought $20,000 worth of inventory before they turn their site up and I tell them no, no, no. Get your site up first. Start with little dollars as possible. Spend as little as possible on inventory. See what the market is out there. One of my friends who is also very successful now started with one product. They got it going. They began to have a feel for the inventory. They got that going and added another product — a similar one — to expand their line. They did a nice job of growing their business. Within two to three years, they will have something to quit their jobs on and work for themselves. But it’s difficult to have an idea today, especially in e-commerce, that will just go through the roof and allow you a 6-figure income within six months and away you go. If you’re looking to sell a product, go to a search engine first. If there aren’t a lot of listings under that keyword, then you may do all right for yourself and you can start to compete. Take for example scooters. If you type it on a search engine, you’re going to get yourself listed as 780,000 of 790,000 on there. You will be at the bottom of the list and no one will ever get to you. But if it’s left handed yo-yos, then you might find something. But of course your market is less. That’s the issue: you have to look at the overall market, and what percent of that market you are going to be. If you have 100% of the left-handed yo-yo market and if it is a million dollar industry, then fine. But if you’re a .00000001% of a multi-billion dollar industry, then there’s almost no sense getting in. Avoid those who give you empty promises, particularly those selling advertising. Remember, your best friend is your calculator. I say shoot for the stars but start with a ladder. So what is your outlook in the next 2-3 years? We’re looking to diversify, maintain steady growth and slowly build the business. We’re projecting 30% revenues for this year, growth over last, and we’re at 60%. Right now we are actually trekking at 80% but we had a slow start due to eToys going out of business. They slashed all their prices and that hurt us in the first quarter. We’ll be somewhere between 60-70% by the end of the year. We’re expecting probably about 20-30% for the next few years, which we’re comfortable with for this product line. If we bring out other lines that start out to become more successful, we’d probably push the percent up a little bit. We’re not looking for a big kill. We’re looking for little small things that add on to what we’re doing well now. So if we find 20 things that give us a 5% boost and there’s a 100% growth, then fine. This is the advice I give to everyone who is growing his or her own business: Think of the true Amazon River when you go to build something. It is built by many little streams and rivulets and little dripping dews that falls on branches that all curves and trickles into making this large body of water. Amazon.com spent billions of dollars digging up a trench for everything to fall into because they have that kind of money. You can truly build a large revenue stream by just finding something that might give you one customer a month. You should have that goal of finding a revenue source – be it a link, be it a small little banner where you have a reciprocal agreement with another site from — just keep looking for places that will give you one or two customers a week, a month, a year. And keep building on those. And some of those may get big, some of those may get small. It’s the same kind of strategy on acquiring a product line. You have a low level of expectations on those products, but keep an eye on them. Work with them well – some of them may get big while as an aggregate to all may very well work together. With the right product, plus lots of hard work and determination, small entrepreneurs can do big business on the Web. Tony Roeder, owner of RedWagons.com, proves that small guys can win the online game.